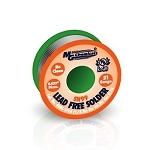 MG Chemicals Lead Free Solder 96 Sn is free of lead and made with silver to pick up the conductivity, ideal for electrical applications and making a strong seal. 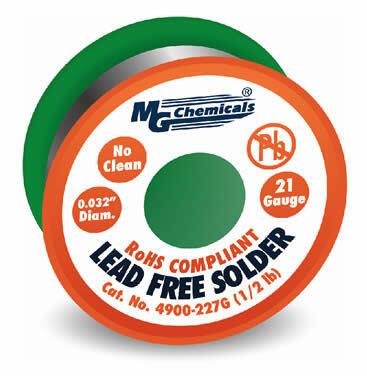 While working with this lead-free solder, you can take it easy knowing that it is safe to use and safe for the environment, meeting RoHS standards. With a no-clean base, this flux leaves no mess, meets J-STD-006 purity standards, and has a hard, non-conductive residue after it dries. Sn96 from MGC can also be de-soldered with an agent, and there’s still no need clean-up! You can use lead-free solder for the same applications you would with leaded solder, there’s no calculations or different procedures to use. Sold in AWG 21, you can purchase various size spools of lead-free solder to meet your work needs from small to large. Even better, when you buy 1 pound, you get 27% more solder in length than you would with a regular leaded product. Tolerance, in +/- 0.002" +/- 0.002"